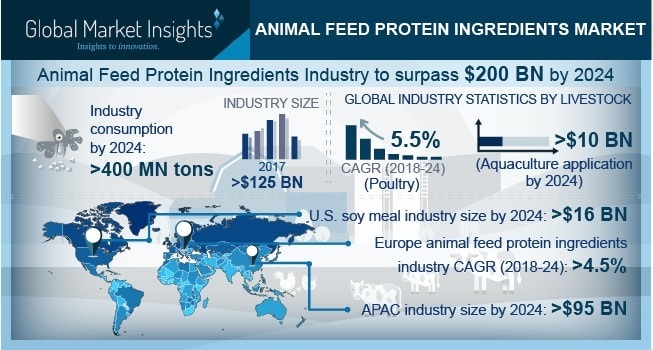 Animal Feed Protein Ingredients Market size is set to surpass USD 200 billion by 2024; according to a new research report by Global Market Insights, Inc. Growing awareness pertaining to dietary protein consumption supported by rise in economic standards has resulted in increasing meat & meat products demand, thereby driving animal feed protein ingredients market size. Feed protein ingredients are key nutrients obtained from rendered animal by products and oil seeds. These proteins help in amino acid synthesis which helps in improving performance and productivity. Increase in industrial livestock production to combat rising protein need supported by enhancements in farming operations and adoption of sustainable farming techniques will fuel product demand. Feeding animal protein improves feed efficiency, immunity, growth performance and yield. Emerging livestock diseases affecting immune response and production accompanied by negative effects on human health may positively impact animal feed protein ingredients market growth. Fish meal accounts for over 3.6% over the forecast timeframe owing to constructive growth in fish meal manufacture. It imparts synergistic effects of vegetable and animal protein accompanied with balancing feed cost. It helps in enhancing palatability, feed conversion, nutrition uptake mainly in young animals. Application potential in swine diets during weaning period to reduce environmental, nutritional and physiological stress will contribute towards animal feed protein ingredients demand. Oil seed including soybean, canola, cottonseed and sunflower along with animal by-product are the key raw materials used in commercial production. Dependency of oil seed production and availability on climate and imports has led to rise in raw material cost. Moreover, restrictions on fish catches has led to supply insecurity. These factors may challenge industry profitability, thereby affecting animal feed protein ingredients market price trends. Feather meal market size from poultry may exceed up to 2.15 million tons up to 2024. Easy availability of poultry offal through slaughter houses supported by rise in demand for feather meal for high nutritional content and low feed cost will stimulate industry growth. Technological improvements in processing industry has led to development of more digestible meal rich in protein content which is likely to positively influence animal feed protein ingredients demand. Germany animal feed protein ingredients market may reach over USD 8.5 billion at the end of 2024. Presence of key compound feed manufacturers supported by improved efficiency in feed production may act as a key driving factor towards industry growth. Sunflower meal market size from aquaculture may account for over 5% by 2024. It serves as a low fiber, high protein meal and a potential alternative for fish meal making feed cost effective in aquaculture. Growing demand for sunflower based product has led to rise in sunflower production which in turn will favor sunflower meal production as a by-product thereby stimulating animal feed protein ingredients demand. Blood meal market size from aquaculture will show significant growth over the forecast period as it acts as a cheaper protein source. It is used in a powder form as a binder in fish feed and lysine supplement in fish, cattle and poultry feed which may favor animal feed protein ingredients demand. U.S. soy meal market size is anticipated to reach over USD 16 billion over the foreseeable timeframe. High production of soybean supported by increasing investments in technological innovation for soy meal extraction is likely to act as a major contributing factor towards animal feed protein ingredients demand. Global animal feed protein ingredients market share is fairly consolidated with key players including CHS, Alltech, Titan biotech, Dupont, Burcon NutriSciences Corporation, DSM N.V., Nutraferma LLC, ADM, Hamlet Proteins, Calysta, and Proliver.